Like a good Bordeaux, a pair of worn-in shoes and women (of course! ), lamb is even better when it matures, as I learned this evening when I cooked it for the first time. I’ve wanted to try it for some time and was urged to do so by the readers who commented on this thread but until today I’d not seen it available. It was in the John Lewis Food Hall yesterday that I saw a sole packet of organic mutton, which I snapped up. Mutton comes from a sheep at least two years old and it needs good hanging and long, slow cooking. But the flavour is nothing short of spectacular –deep, rich and almost gamey. Mutton is increasing in popularity through the good press it’s receiving, from celebrity chefs and the like but, as I’ve found, it can be difficult to get hold of, so if you do see it I urge you to try it. There’s nothing fancy about the dish I put together this evening, it’s just a simple, homely casserole and in it’s simplicity it’s perfect – after all why dress mutton as lamb rather than appreciate it for what it is, that is, a damn fine meat? 1. In a casserole dish brown the mutton in olive oil over a high heat until well browned. Remove from the pan. 2. Saute the onion, celery and garlic in the same pan until starting to soften and colour a little. 3. Put the mutton back in the pan and sprinkle over the flour. 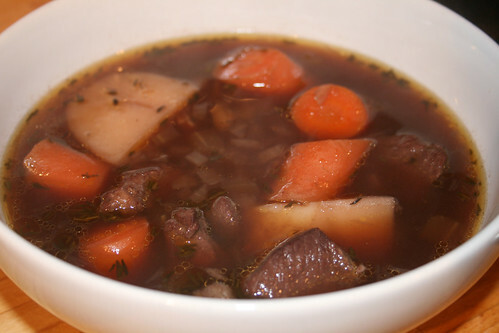 Mix well, then add the red wine, beef stock, thyme, carrots and potatoes. Season well. 4. Bring to the boil then reduce to barely a simmer. Put on a lid and cook slowly for 2 hours. 5. Check the seasoning and if using fresh thyme remove the sprigs before serving. Previous Post In the Bag: Cooking the Month of January – The Round-up!